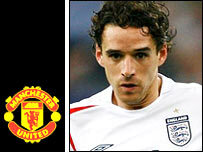 Bayern Munich have claimed they will report Manchester United to football's world governing body Fifa unless they end their pursuit of Owen Hargreaves. United have confirmed they want to sign the 25-year-old midfielder, who has also stated his desire to join them. Bayern chairman Karl-Heinz Rummenigge has warned United to cease their interest or "we will turn to Fifa". "A club may only contact a player when the club holding his contract agrees to it," he told German newspaper tz. England international Hargreaves has a contract with Bayern running until 2010. And Bayern have already made it clear they expect it to be honoured. The German club's general manager Uli Hoeness said: "Hargreaves is well advised to keep quiet. "Otherwise I will get very angry and that will not be good for him. I can't understand that after two discussions he is still forcing the issue." Hargreaves was omitted from Bayern's side for the Bundesliga match with Bochum on Sunday after talks with the club. United boss Sir Alex Ferguson is determined to bring the player to England and is thought to be willing to pay £17m. But Hoeness added: "He won't be released under any circumstances. He needs to accept the decisions of those above him and show some respect." Ferguson has already admitted Bayern have so far resisted their attempts to add Hargreaves to the summer capture of Michael Carrick, saying: "We are trying hard but Bayern are proving very stubborn and resistant, which I can understand." A Bayern statement said they had not held negotiations with United and asked for the English side to cease pursuing the player. Hargreaves has been at Bayern since moving to the club from Canada as a 16-year-old in 1997. He helped Bayern to the Champions League crown in 2001 and has also won four Bundesliga titles with the club. He seems determined to seize on his raised profile in England following his combative and tough-tackling displays during the World Cup and an impressive performance against Greece in coach Steve McClaren's first game in charge.